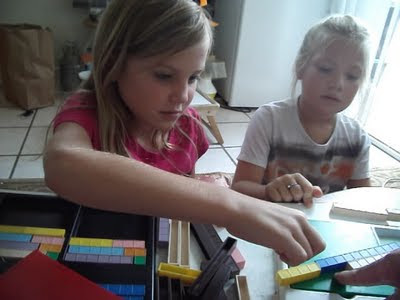 These two are bright and energetic...their math experience is limited so it's more fun and exciting for them than a lot of kids their age...each lesson is full of discoveries. Makes it fun for me two. Now the trick will be trying to capture some of the ah-ha moments on video. Here is a snippet of my first meeting with them. They informed me that they don't do multiplication. We played and had fun and the hour went quickly. Their mother and little sister stayed for the first one. A good time was had by all. The next lesson was just the two of them and we covered a lot of ground...their homework was and will be "do multiplication." Normally you need a password to see vids like this but just for fun and because it's basically a compilation of a bunch of other stuff with other students you can already get for free on Youtube or my Screencast channel, I put it here for you for FREE. Lets other parents see how to run a lesson for beginners too. As you can see we cover lots of ground and lots of concepts just to expose them to the mathematics, not expecting them to retain it all for a test later. They are being exposed to math. We will focus on the basics of counting and then get to more complex counting as we move along but they are seeing first hand is that all math is, is counting. Multiplication allows you to count very quickly and therefore MUST be mastered. There are many half hour and longer sample lessons on the password protected pages at Crewton Ramones's House of Math along with pdf's and detailed explanations of how to teach various topics of math using manipulatives...there are also tutorials for parents and teachers as well as links to an hour over-view of Mortensen Math.